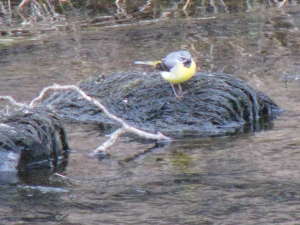 Observation - Grey Wagtail - UK and Ireland. Description: Vibrant yellow breast and under tail with grey back. I saw two of these on the edge of the river, gorgeous little birds. Vibrant yellow breast and under tail with grey back. I saw two of these on the edge of the river, gorgeous little birds.